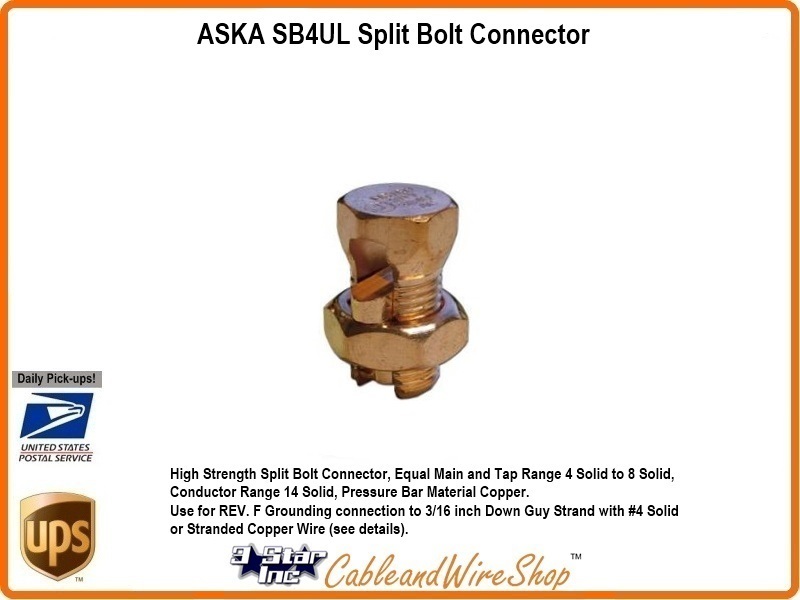 High Strength Split Bolt Connector, Equal Main and Tap Range 4 Solid to 8 Solid, Conductor Range 14 Solid, Pressure Bar Material Copper. Use for REV. F Grounding connection to 3/16 inch Down Guy Strand with #4 Solid or Stranded Copper Wire (see details). REV. F Tower Grounding kits are based on 8 foot ground rod use, REV. G Tower Grounding Kits use 10 foot ground rods (that can only be shipped LTL Freight). REV. F Tower Grounding Kits use #4 Solid or Stranded Copper (use a regular 5/8 inch ground rod clamp), whereas REV. G Tower Grounding Kits rely on 7/16 inch Galvanized Steel Wire Rope (select the 3/4 inch ground rod clamp we sell here).